Exactly 15 years ago today, Whiskeytown ceased to be a “band” in the way that word is usually meant. It happened at a show in Kansas City, three dates before the end of the initial run of touring for 1997’s Strangers Almanac album. Tensions were high even before the show, things got worse onstage and a blowup ensued. Ryan stormed off after reportedly telling the stunned crowd it had just witnessed Whiskeytown’s last-ever show. That wasn’t entirely true, because there was still a Whiskeytown after the dust settled. 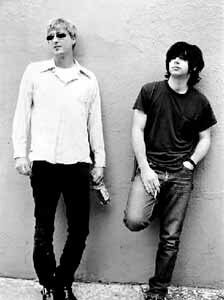 But it was a group, not a band, and well on its way to becoming the Ryan Adams Project. Even though Ryan insisted that wasn’t what he wanted, it was the undeniable truth. Over the next two years, Whiskeytown’s lineup became a revolving door with a near-constant shuffle of utility players coming and going from one tour to the next. By then, Phil was already well into bouncing back with his post-Whiskeytown band, Jesse Sykes and the Sweet Hereafter, which remains a going concern (here’s a review I did of the last JSatSH album, from 2011). Phil has also done some studio work with a few well-known peers, including Death Cab For Cutie and Nada Surf. The last time Phil and I spoke was when I interviewed him for “Losering” in early 2011, and he had some interesting and occasionally harsh things to say. He also told a pretty hilarious story about what it was like to open for Ryan at Red Rocks in 2007. But you’ll just have to read the book for that.